Wolfgang Amadeus Mozart was born on a cold January morning in the independent Archbishopric of Salzburg in 1756, when every king and queen from St. James’s Palace in London to the court at the Winter Palace of Saint Petersburg wanted a piece of the nearby Austrian art. Actually, they competed each other in this matter looking to be crowned the ‘art’s patron king’. Mozart’s father, Leopold, was a a musician working for the archbishop of Salzburg and though not truly skillful, it seems he was a very good teacher and his treaties in violin playing techniques served as a handbook for many contemporary musicians. As soon as Mozart was born, Leopold resigned from his duties and devoted his time to his youngest son. Mozart’s life was music since the very beginning and at the age of three he was a fine pianist. By the age of five not only Mozart was able to play the piano and the violin, among many other string instruments, but he was already composing minuets and other pieces that amazed his father who believed he had to share his son’s overwhelming talent with the rest of the world. His first tours lasted more than a decade in which he kept on composing many works. His composed his first Symphony in London, under George III protection, where he met Bach and his influence. In Paris, Mozart lived in the court of Versailles. It was the time of king Louis XV and courtesan Madame de Pompadour. She was known for loving art but also for being pretty arrogant, ‘as if she were an empress’ would say Leopold. The Duchess of Pompadour refused to kiss the little genius after his acclaimed debut because he was a boy after all and she was afraid he would stain her dress. The Mozarts arrived in Italy where Wolfgang entered Boloni’s Philharmonic Academy -the most prestigious in Europe- at the age of 14. The minimum age required was 20 but Mozart was already very famous. Then and there he composed his celebrated ‘Exsultate, jubilate’ and got the custom of playing the piano with his eyes folded just to amaze the audience even more. In 1773 the family would return to Salzburg but not for much time. 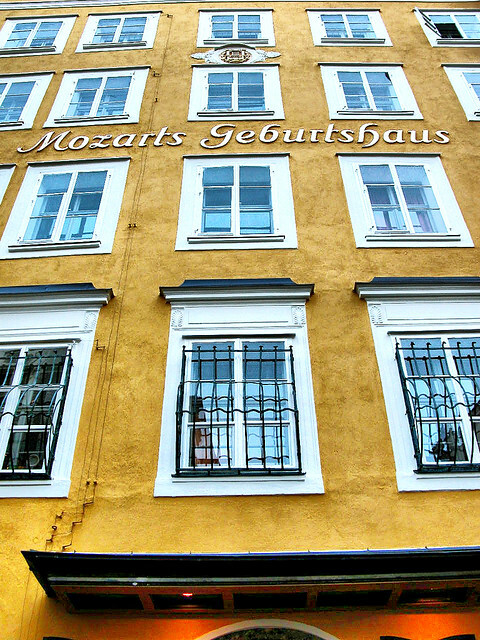 Mozart enjoyed his popularity in his hometown but it was too much and the genius had little time to compose. Besides, the archbishop was a mean person and Mozart’s salary was a dime. Despite everything, he loved music and was always working so he composed many of his most famous liturgical works while in Salzburg and his well-known five concerts for violin, nowadays a must in this instrument repertoire. If you want to see Mozart’s Salzburg, NH Salzburg City is right in the middle of where he lived and composed. Actually, Mozart is a huge tourist attraction and the whole city is tributed to him but it has many more attractions such the breathtaking Mirabell Palace and Gardens or the numerous neoclassical streets and squares, full of coffee shops, terraces and flowers. There are also many music festivals all along the year. Check out their dates to match your trip, it’s really worth it. Mozart moved to Vienna after a huge final argument with the archbishop, and it was for good. He met the most prominent composers of his time there, like Handel or Haydn, and he also fell in love, got married and had 6 children. He spent many years in the court of the Austrian emperors where he kept on being as prolific as before but he focused his efforts in opera. In 1786 he composed The Marriage of Figaro and one year later Don Giovanni, both extremely successful. The Mozarts began living the life as a big spenders and they saved no money. Everything would have gone well but the war between Austria and the Ottoman Empire erupted and concerts started to become scarce. The Mozarts met poverty once again, but they would never recover. In spite of everything, Mozart composed until his last breath. He released The Magic Flute in 1791, some months before his death, which we will never know how it happened. As with Mrs. Monroe, there are many hypothesis, ‘poisoned with mercury by a rival’ included. Mozart’s influence grew after his passing away and compliments kept on coming not only from the audience but also from his fellow musicians and artists. It is said that Hayden told Mozart’s father that the gifted child was the best composer he ever knew, in person or by name. Beethoven was also Mozart’s fan and Hoffman, one of the most active artists of German Romanticism told that Mozart expressed in his works what words can’t even suggest.